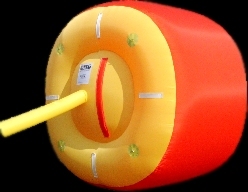 These inflatables can be installed in the Gas Turbine's exhaust duct. 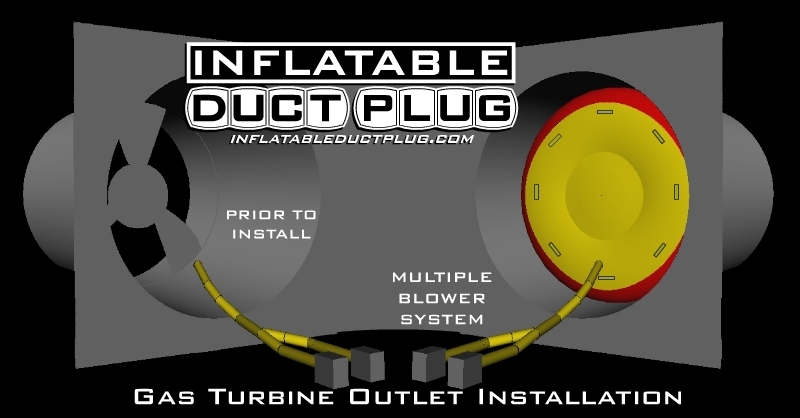 A multiple inflation fan system can be installed, allowing one to keep running in case of a power failure. Each inflation fan should be installed on a separate circuit. They can offer substantial time savings for combined cycle plants during an outage by making it possible for work to be done on both sides of the inflatable barrier. This can often decrease the outage by a matter of days while doing repairs, blasting or maintenance. Installation is fairly simple. Unpackage and unfold the balloon in the duct work. Attach the inflation tubes to the blowers. Make sure all zippers on the inflatable are closed. Power on the blowers and use the 2" webbing handles to guide it into place as it fills with air. This can typically be done by 2 people. Removal is just as simple. Turn off the blowers. Allow the inflatable to start to come down. When the zipper handles are within reach, deflate the balloon by opening the zippers. Roll and fold it similar to a tent to remove air and place back into the storage bag.